CHICAGO – This old Headbanger would like to personally thank “Alien Weaponry” for providing a much-needed shot of adrenal into the future of Thrash Metal. While I consider myself an optimist, if you had told me that the resurgence of the genre would come from three teenagers that hail from New Zealand, I would have told you that you were crazy. Alien Weaponry will be appearing (w/ Ministry and Carpenter Brut) at The Forge in Joliet, Illinois, on November 29th, 2018 (6:30pm). For more details and to purchase tickets, click here. The teenage bandmates of Alien Weaponry – Lewis de Jong, Henry de Jong and Ethan Trembath – were raised in New Zealand learning the Polynesian Māori language and submerged in that culture. The unapologetic, full throttle Thrash Metal band have found a unique way of expressing, through their music, the political outrage regarding social injustices that have occurred to the indigenous Māori people. The bands thunderous drums are layered with heavy guitar riffs and raw and aggressive vocals. The lyrics contain chants from the traditional Māori haka (War Dance) and expresses the Māori fighting spirit, often emphasizing the importance of Māoritanga and Whānau (Family). Alien Weapony’s fearless approach of bringing together the Māori culture and Thrash Metal has created something new and captivating. To watch their official video for the song “Kai Tangata,” click here. For “Rū Ana Te Whenua” click here. In anticipation of their show at The Forge on November 29th, I (Jeff Doles of HollywoodChicago.com) interviewed Lewis De Jong of Alien Weaponry, as he represented the band on their philosophy, unique sound and the road stories of a traveling Thrash Metal band. HollywoodChicago.com: Who came up with the idea of incorporating Māori language and culture into the band’s music? Alien Weaponry: In New Zealand, there is a school competition called ‘Smokefree Pacifica Beats,’ where at least 25% of the lyrics have to be in Te Reo Māori. Some friends of ours in a Ska/Reggae band called ‘Strangely Arousing’ won it one year, so we thought we’d give it a go as well. We wanted to stay metal, though, and we wrote the whole song in Te Reo Māori. We were a bit surprised that it took off, but it just worked so well. As people have caught onto it, I suppose you could say it’s become our thing. Henry and I went to a kura kaupapa Māori [total immersion Māori school] when we were younger, but we had started to lose the language, so incorporating it into our songs has been a great way of getting back into it. HollywoodChicago.com: What is the reaction from the Māori people to your music? Alien Weaponry: Most Māori people really love it, and a lot of them have said it has inspired them to learn Te Reo and explore their roots, which is awesome. A bit daunting sometimes, but overall awesome. HollywoodChicago.com: What is the inspiration for the band’s name? And what were some of the other names you considered? Alien Weaponry: The band name came from a movie called ‘District 9.’ When Henry and I were younger, we watched that movie, and we loved all the ‘alien weaponry’ in it. We had just written our first song together, so we decided that’s what we were going to call our band. I can’t actually remember if we discussed any other names… I think it was just a spur of the moment decision. It was a unique name, so we stuck with it. HollywoodChicago.com: The album and tour is receiving critical acclaim in the United States. How are the band members handling that attention, and have you found any advantages to the newfound success? Alien Weaponry: This year has been our biggest one so far, and it definitely has been a little difficult trying to balance between band activities – like touring, rehearsal and press – and other commitments, but we’re doing okay. Ethan [Trembath] actually managed to pass his classes for this school year, even though we have been on tour for half the time. We’re really stoked about the album’s success in the United States. We spent some time today with Jose [Mangin] from the Liquid Metal show on SiriusXM, and it’s a real buzz for our work to be recognized by somebody that important in the music industry. It’s definitely a help to get good reviews and support… we’re just taking things as they come, though, and not getting too crazy. HollywoodChicago.com: How does your Dad’s previous music industry experience help the band navigate your current situation? 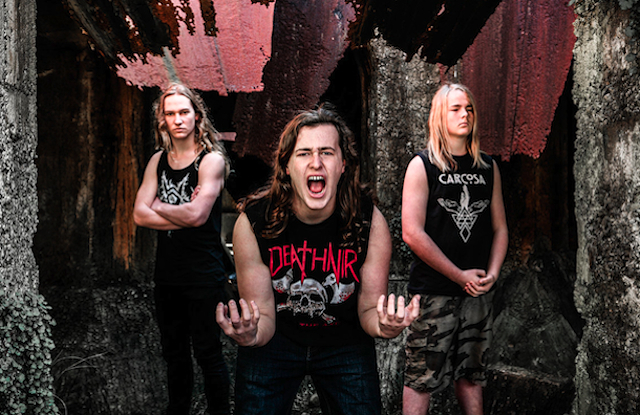 Alien Weaponry: Our Dad used to play in bands, and he also used to be a mastering and studio recording engineer, plus he had previously worked for MAX TV, New Zealand’s first ever Music TV channel. Besides looking after our social media and doing our front of house sound, his contacts and experiences have definitely helped us get where we are today… he just knows the ins and outs of the music industry in general. He has taught us the importance of looking out for our gear, packing up quickly after a show, respecting our fans and staying humble. We would not be near anywhere we are today without him. HollywoodChicago.com: What are your thoughts on the metal scene in the U.S. and how is it different or similar to your homeland? Alien Weaponry: So far, our experience with the U.S. metal scene has been pretty minimal because we haven’t done any performances yet… we just had our first show in San Francisco last week on November 21st. But when we talked to Jose from the Liquid Metal show, he was telling us all these amazing things about the metal scene over here, so we’re all super excited to get in front of a U.S. crowd! Definitely the metal scene here is much bigger. There are a lot of legendary metal bands who come from the U.S – like Anthrax, Slayer and Metallica – and metal as a whole is more widely listened to here. But metal is a culture shared throughout out the world, so there are similarities too… in the end we are all just one big family. HollywoodChicago.com: Every band has good road stories. What is one of your favorites? Alien Weaponry: It just happened earlier this year, when we were touring Europe, but it has become embedded in all our memories. As we were driving from ‘MetalDays’ in Slovenia up to Wacken in Germany, we had a tire blow out on our caravan on the autobahn in Austria. It had just got dark and a huge thunder and rain storm had just started, and forked lightning was flashing everywhere, which lit the forest all around us. We had to get out of the van, and we all stood huddled on the side of the road in the freezing cold… it felt like we were in a horror movie, and something was going to come out of the woods. We had to call an auto breakdown service because we didn’t have the right tools to get the tire off, and then we were waiting for ages because they got lost. Eventually a guy from a completely different breakdown service stopped, and actually fixed the tire for free, so it was a good ending. HollywoodChicago.com: Finally, since you and Henry are brothers are in the band, what lessons have your learned from Oasis – or other bands with siblings – in keeping things cool between you? Alien Weaponry: Henry and I do definitely argue, but we deal with it. We have a really strong connection when it comes to songwriting, so that is always a motivation to sort out any differences pretty quickly. We’ve been writing songs and making music together all our lives, and I wouldn’t have it any other way. The Forge – 22 West Cass Street, Joliet, Illinois – presents Alien Weaponry, with Ministry and Carpenter Brut on November 29th, 2018, at 6:30pm. For the website of Alien Weaponry, click here.